﻿ Changzhou Hengli Machinery Co., Ltd.
"people-oriented, Science and technology prospering corporation, Honest management, Meticulously in building the Hengli brand"
Changzhou Hengli Machinery Co., Ltd. is a company specializing in the production of plastic weaving machineries and plastic recycle machineries. Adhere to the "people-oriented, Science and technology prospering corporation, Honest management, Meticulously in building the Hengli brand, Maximize the benefits for the clients" business philosophy. 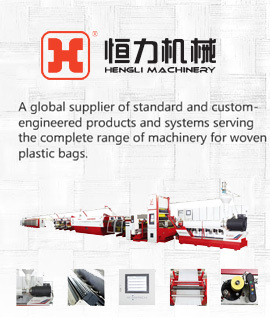 Hengli has a strong sense of social responsibility and national brand, its developing new products and improving production technology leading the international consume trend of environment protection and energy saving, devote Hengli itself to development of plastic weaving and recycle products, and other relative products. Changzhou Hengli Machinery Co., Ltd. located in the Yangtze River Delta region, which is an economically developed area, has close research activities with the Beijing University of Chemical Technology, Donghua University, Harbin Institute of Technology and the Chinese Academy of Sciences, undertaken a number of national Torch Program and scientific and technological projects in Jiangsu Province. Hengli has a strong independent research and development ability and innovation ability. Hengli’s Tape Stretching Line and Plastic Circular Loom not only sell to China domestic large scale petrochemical enterprises and packaging enterprises, but also exported to the more than thirty countries and regions all of the world, all products received the praises from clients. Hengli obtains clients’ trust with its products with advanced technology, excellent processing, excellent quality, perfect after-sale services. The main products are: A, Tape Stretching Line B, plastic Extrusion Laminating Machine C, Plastic Circular Loom D, plastic recycle machine E, Inside Lamination Machine. 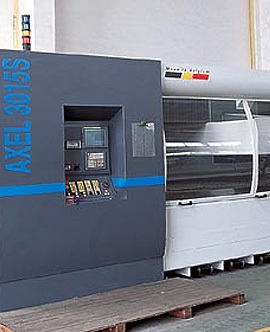 Five-axis machining centers, Four-axis boring and milling centers, laser cutting machines and other high-precision equipment. Hengli had established a complete quality control and guarantee system. From processing equipment to the testing equipment, all to ensure product quality.. Customer satisfaction is our greatest achievement!